One of the oddest stories from Northrhine Westphalia is the accident which befell Tuffi the elephant. In 1950 the travelling Althoff Circus arrived in Wuppertal, and with them their four year old circus elephant, Tuffi. While the circus was setting up, the circus trainer had got into the habit of travelling around whichever town they were in with Tuffi, to advertise the upcoming performances. His favourite way of getting publicity was always to take the little elephant for a ride on the city tram – which inevitably caused a stir and plenty of press coverage. Of course anyone who has been to Wuppertal will know that this town has a very ususual tramline. Built in 1901, the Schwebebahn is probably the oldest operational suspended railway in the world. It is built on an iron structure which spans the river Wupper. It was onto just such a train that Tuffi’s trainer decided to take her. The arrival of the elephant at the station caused quite a stir. Many journalists from the local and national press had elected to accompany the elephant on her trip. So when she entered the Schwebebahn carriage, dozens of people pushed in alongside her. 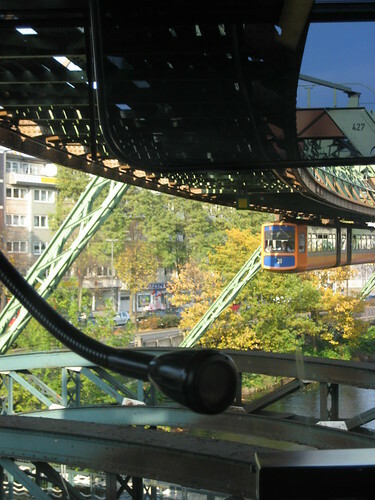 Travelling on the Schwebebahn is not like riding on a tram though. The trains sway considerably more and often pitch at quite odd angles. Normally a very calm animal, with the crowds and the motion this time, Tuffi panicked. First she managed to break one of the seats in the carriage, and then she attempted to get out of the window. Her first attempt only broke the window – but her second effort was successful – the elephant broke a hole in the side of the carriage and jumped… dropping far down into the river below. Remarkably, Tuffi was unhurt by her unexpected plunge into the river Wupper. Apart from a few grazes, she was able to extricate herself from the water and return to the nearby circus. Tuffi continued to work at the Circus Althoff through the 1960s, then she was sold on to a French circus where she worked for many years until her death in 1989. 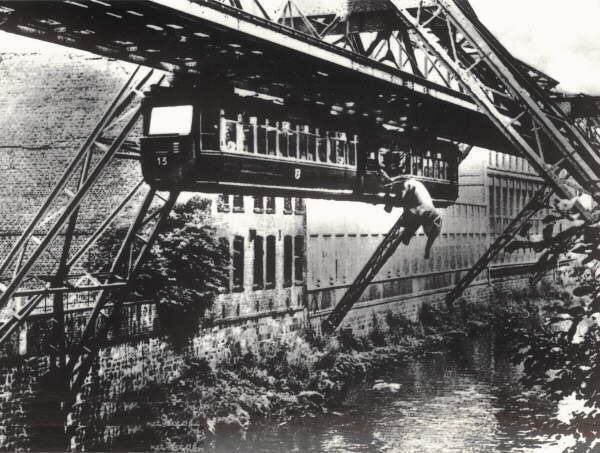 Throughout her life she continued to travel happily on trams, but never set foot in the Schwebebahn again. Great story. Imagine if it happened today with iphones and cameras! i dont think elephants are allowed to use them—expecially in italy where there ROMEing charges! That’s not the kind of story you hear every day. HA! That’s a great story.